Home BUSINESS MTAANI CON ALERT! How Thika people are losing money to fake Landlords. CON ALERT! How Thika people are losing money to fake Landlords. We are once again warning Thika residents to be wary of all these "HOUSE TO LET" adverts being pinned on trees and electric posts and in the vicinity of new buildings coming up all across the town. Some conmen have perfected the art of coning people and are now duping people with these fake adverts. These are mostly youth, either still in college or have just completed and are hustling to eke a living. And since they know the challenges students joining colleges face in getting proper accommodation, they will trick you into believing that they are actually real estate agents, landlords, sons of landlords or caretakers of residential houses. These people have a very good geography of the area and know almost every new building coming in the area or where there is a vacant house to let therefore anytime you call them, they will have an idea of the place and how to trick you into believing their story line. 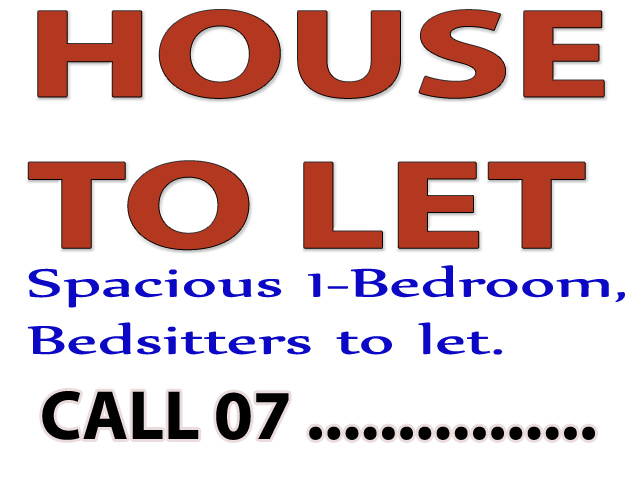 Once you call the numbers on the advert, they at times pretend to be either the caretaker or the son of a landlord (like one who is very notorious who pretends to be the son of a bishop landlord). They will also tell you that the house in question is actually in very high demand and the and then send you very beautiful photos of houses via WhatsApp. They will cook up a story that "in fact kuna mtu anaingia leo leo so ukitaka tushike hiyo nyumba send deposit in advance". They at times will give you a different number to call "the landlord" so as to confirm if the purported new tenant has already vacated into the new house. If you call the second number, the recipient (who is actually the same guy or an accomplish) will fake the accent of an old Kikuyu mzee who will give you the same story. Once you send this cash Piuuu.... both lines go off or you get blocked and you are no longer able to reach these conmen.. Majority of the victims are usually new students in town or freshers wa town who are desperately looking for accommodation.